The country's biggest hospital is in the middle of a structural crisis, but reports tonight say the KHMH could also be facing a labour crisis after the firing of two well known doctors, Alain Gonzalez, and Salvador Pagagua. Both doctors were escorted out of the hospital by security after their terminations. For Gonzalez - who is a former UDP city councillor - he got taken out by security twice, while, Pagagua was terminated, re-hired, and then fired again one day later. 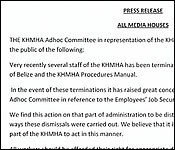 These terminations and others have forced the KHMH staff into emergency labour meetings - three of them held in a two day span. The most recent was held this afternoon at the Lion's Lester H. Young Building - this, reportedly, after hospital administration refused to let them meet in the hospital cafeteria. And, this evening, the KHMH Ad Hoc committee - which was formed during labour tensions in 2015, sent out a release. It says, quote, "the committee, in representation of the LHMHA employees wishes to inform the public of the following: Very recently, several staff of the KHMHA have been terminated in contravention of labour laws…and the KHMH Procedures manual….it has raised great concerns to the staff…in reference to the employees' job security. We find this action…to be distasteful and very troubling in the way these dismissals were carried out…we believe that it is a travesty and an injustice on the part of the KHMHA to act in this manner. " end quote. Director of Medical Services, Dr Lisa Johnson." No ultimatum was issued after that, but clearly, relations between administration and labour are at a tense impasse. The release came in late, and we were unable to get comment from the KHMH administration, but we hope to do so tomorrow. 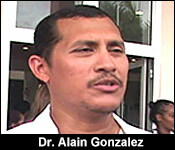 As regards, Dr. Alian Gonzalez, we understand he is appealing his termination to the Board of Directors. He received his letter of termination when he showed up to work on Saturday April 7th. As we understand it - the letter did not state a reason for termination. He had been at the hospital for over 10 years. 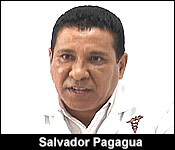 Reports say that , at least one more doctor - a general practitioner, and an attendant have been fired.